Clothes of the Tatar people as they have been formed by the middle of the 19th and early 20th centuries are the most original sphere of material life. Natural, economic and social conditions of life of the Tatar people, their ancient traditions, ideology, aesthetic tastes as well as the cultural cooperation with the other peoples influenced the formation of their clothes. It is generally known that the ethnic basis of the Tatars were the Turkic-speaking tribes who settled on the territory of the middle-Volga and Kama region long before the Mongol invasion. The Turkic-speaking tribes, being the main ethnic link of the economically developed early-feudal states had the longstanding trade ties with the East and Europe. Therefore the oriental silks (satin, velvet, etc.) 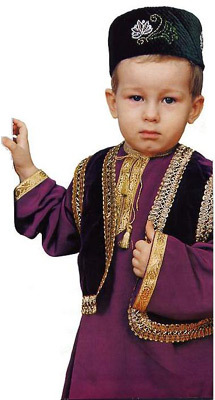 as well as the Central Asian fabrics, particularly adras, found an increased use among the Tatars. For men's outdoor clothes the European (English, Holland) wollens, broadcloth were bought. With the advance of the textile industry in Russia the Russian fabrics had a wide application. At the same time in villages for sewing underwear and ritual clothes the homespun linen or hem fabrics were used. The combination of the domestic and manufactured imported fabrics has long been inherent in the Tatars. Although the national costume of some local groups of the Tatars differed in some details, the composition, the cut of its elements as well as the range of the colours remained common. In the historical costume of the Tatars white colour occupied a prominent place. About two centuries ago until the printed cotton was produced, white shirts and dresses made of the homespun fabrics were the most popular among the provincial Tatars. The Tatars considered a pure-white colour to be the colour of the aged people. Shirts of young people, especially of women, were trimmed with patterns, in which the red colour dominated. Red were the head coverings of young women and the sashes of young men. As a. whole the traditional costume of the Tatars was characterized by multicolourness and ornamentation. The decoration of shirts of the young Tatar women from the Oksk-Sursk basin (Mishars) was full of symbolics. The breast and lap of their shirts were decorated with pieces of bright particoloured fabric or embroidery. The Tatar women, particulary those living in Kazan or the nearby villages gave preference to the one-colour shirts (blue, pink, green). For trimming braid, fringe and white eiderdown were used. The breast cut was decorated with uka izu ruffle ornament. A dark colour fabric, including the black one was used for sewing the outerwear partucularly men's clothes. From the black fabric the Kryashens sewed kamzols (sleeveless or short sleeved jackets) of dzhilyans (women's light outerwear), brightening their edges with braid. In the Transural regions black sateen was used for sewing aprons both for women and girls, a large part of the aprons being trimmed with the embroidered patterns. Kulmek shirts and yshtan trousers formed the basis of the Tatar traditional costume (men's and women's). Excepting the ritual shirt of a bride-groom men's shirts were not embroidered. Cut out in a straight line men's shirts loosely fell up to the knees. They were not belted and tucked in the trousers or sharovary. Over shirts men wore wa-isted kamzols, which were just higher than the knees, either sleeveless or with short, up to the elbows, sleeves. Men's summer outdoor clothes included a waisted kazakin (outerwear of dark factory-made fabric) or a straight-backed dzhilyan. Men's winter clothes consisted of a warm bishmet (outerwear of dark factory-made fabric), a fur-lined coat (more often a sheepskin coat), sometimes a waisted or straight-backed chikmen (outerwear of the homespun or factory-made broadcloth). Men's outdoor clothes especially the straight-backed ones were belted with a long factory-made bilbau sash. At home men wore tubetei scull caps. Only the Kryashens, who perceived a scull-cap as the Islam attribute, didn't retain it in the set of their costume. Tubetei scull-caps were made of the factory-made fabric, the dark one-colour fabric being often used. They were trimmed with embroidery (silks, gold and silver threads, beads). Scull-caps made or the dark velvet (kelepush), brocade or othet silks were not decorated. In summer men put on a meskeu burege outdoor head-gear, made of natural or artifical astrakhan. Men's winter outdoor headgear was a kyrpuly burek fur band hat. The traditional footwear of the Tatars were chitek soft-soled boots and hard-soled leather galoshes. Peasants' footwear included chabata bast-shoes worn with the white broadcloth or knitted stockings. Clothes of the Tatar women were extremely diversified in details as well as in sets. Women's kulmek shirts were identical to those worn by men in style, i. e. they were tunic shaped. Under a shirt women wore a kukrekche ruffle, which was slightly seen in the collar slit. Women's shirts were ankle-length, uncut or cut below the waist. Kamzols worn by women were made of the bright, more often green, cherry or dark-red velvet fabric or the Central Asian adras, seldom of brocade. For trimming the lap and edges of kamzols a rich set of the factory-made accessories (galloon, lace, etc.) was used. Until the middle of the 19th century the Kazan Moslem women when going out put on dzhilyans (one-colour or brocade) decorated with a wide braid band. Women's winter outdoor clothes included a bishmet, rarely a fur-coat. Women's bishmets in contrast to those worn by men were made of the bright thick fabric, sometimes of silks (velvet, etc.). They were trimmed with fur and fastened on the left side of the waist. The alyapkych apron formed a part of the clothes of the young Tatar women and men living in Kazan and in the Volga-Ural region. It was the element onot only the work but daily clothes as well. In women's wear it was the element of a holiday dress. The apron was usually decorated with the woven patterns or embroidery. Traditional headgear of the Tatar women is peculiar and original. Early in the history a noticeable distinction was made between the headgear of an unmarried girl and a married woman. Women's headdresses retained their local peculiarities. Girl's headgear included a takya hat and a soft (without hard band) kalfak headdress worn with uka chachak headband. Knitted with threads of different colours the town kalfak headdresses were decorated with embroidery, chenille, volume applique, braid or silver fringe. In the second half of the 19th century the hard-band velvet kalfak headdresses were in wide use among the Tatar Moslem women. Both girls and women wore them in combination with the factory-made head-coverings. Up to the late 19th century the compound headgear including a chechkab hairdress and a tastar towel-shaped head-covering went on existing among the Tatars of the Oksk-Sursk basin (Kasims and Mishars). Traditional headgear of the Kryashens is also very original. On the one hand it retained the archaic shape of the Tatar head-coverings (bash yaulyk, ak yaulyk, tugerek yaulyk) and on the other hand it included a melenchek hairdress and a sureke headdress adopted from the Russian women. In combination with chigeche temple coin ornaments and oly syrga large filigree earrings the headgear set of the Kryashens appeared rather archaic. The base of the headgear worn by the Astrakhan Tatar women was a high frame with a miyezbek head band and a chigelek temple ornament. The high frame headdresses were also worn by the Kazan Tatar women in the late 18th and early 19th centuries: A headgear set of the Siberian Tatars was charac-rerized by a sarauts head band. Of great variety were the Tatar women's traditional head-coverings (kyekcha, urpek, tastar, kushyaulyk, etc.). The old women put on kamchat burek fur band hats over the head-coverings. Girls also wore the fur band hats most often without any head-coverings. Typical of the Tatar women's footwear were chitek and kevesh patterned shoes. During field work the Tatar women as well as men put on bast-shoes worn with broad-cloth or knitted stockings. Jewelery was widely favored by the Tatar women. The most popular material for jewelery was silver. Silver was combined with the precious stones: cornelian, turquoise, emerald, etc. Adornments made of gilded silver had wider distribution than those made of gold. The Tatar craftsmen were the masters of various techniques (melloing, filigree, engraving, etc.). Very effective was the technique of incrustation of the filigree cells with turquoise, cornelian. The head (forehead, hair, ear), neck, breast and hand ornaments were extermely varied. In the rural areas silver coins, corals, pearl buttons were often used as ornaments. Shoulder band and large fabric breast ornaments covered all over with coins were of particular characteristic of the women's costumes of the Kryashens and Mishars from the Oksk-Sursk basin. The turn of the 19th and 20th centuries was the epoch of the development of new forces and democratic tendencies. In clothes the spirit of the times was expressed by more daring creative approach to the traditions, making the process of loss of the clothes local traits more active, consolidating them in the common national standard. However the process of formation of the national clothes of the Tatars was realized with different intensity in various regions of their residence. For example the Kryashens didn't accept the national form of clothes at all. In towns and the nearby villages this process was more active. Under the influence of new forces the traditional dress of the Tatars lost some archaic features. A new refined style of the Tatar costume was formed. In women's wear this style was characterized by a dress with a short close-fitting sleeveless jacket (kysmaly kulmek), a small pinned kalfak headdress, ichigi patterned boots or shoes. In men's wear it included a slightly shortened shirt, a shortened kamzol, trousers of the European model, a short kazakin, a kelepush plain top scull cap made of black velvet and ichigi boots with kaush leather galoshes. Today the Tatar national costume actually came out of use. But its variants stylized in imitation of the festive national dress continue to exist in the costumes of participants of the amateur performances, i. e. on the stage.